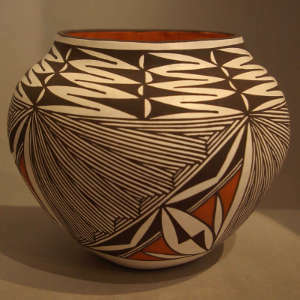 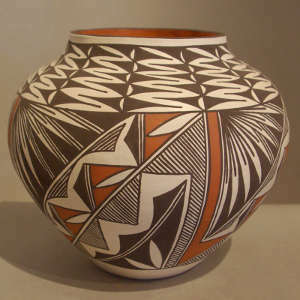 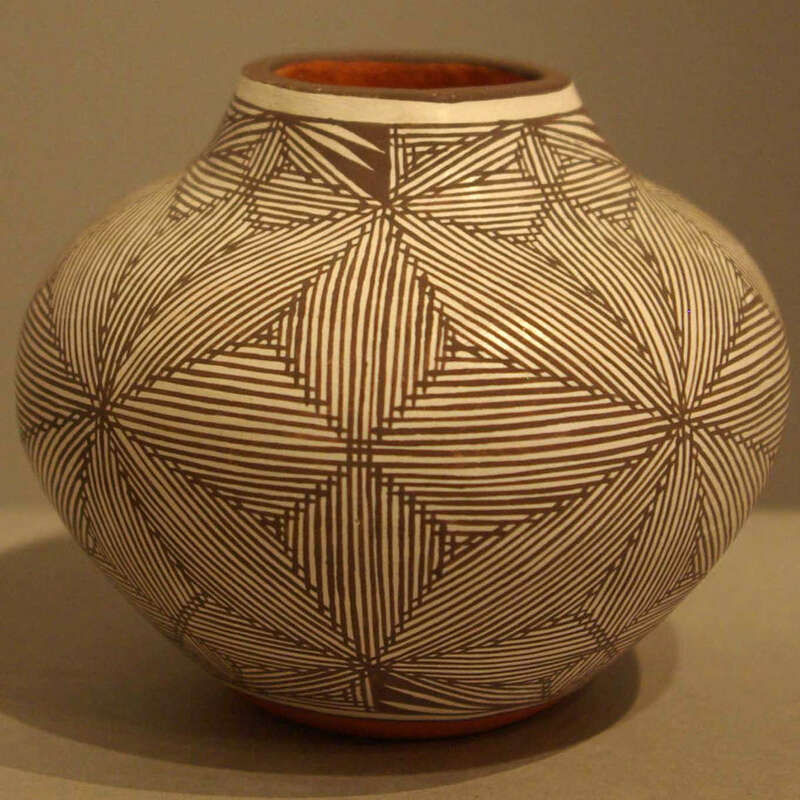 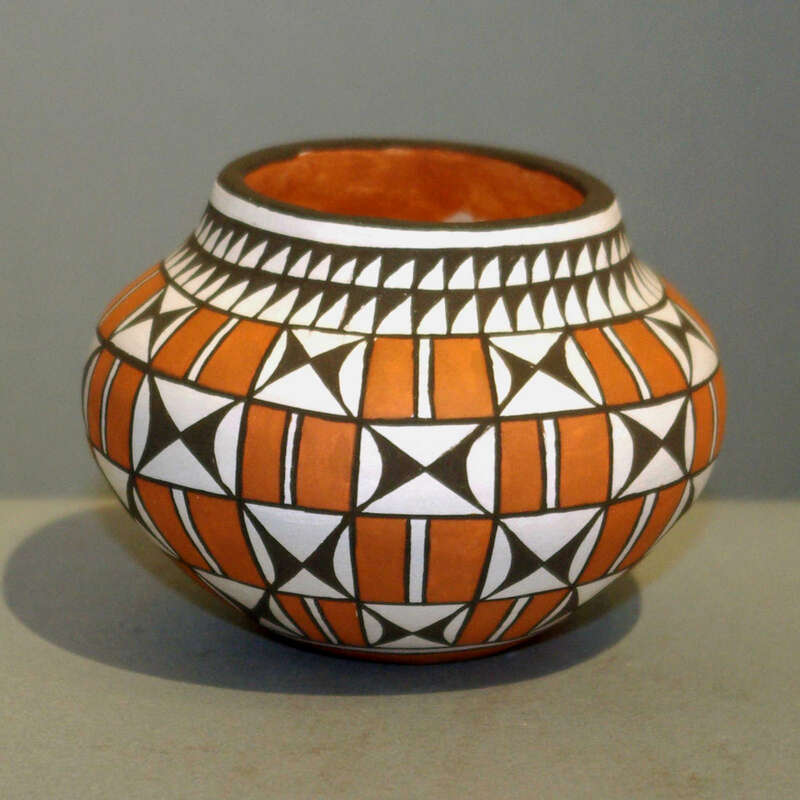 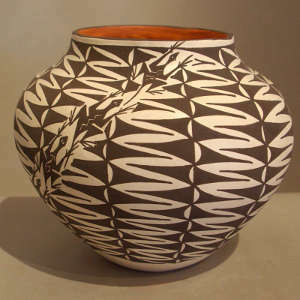 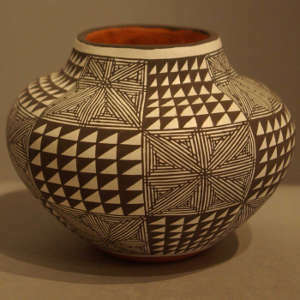 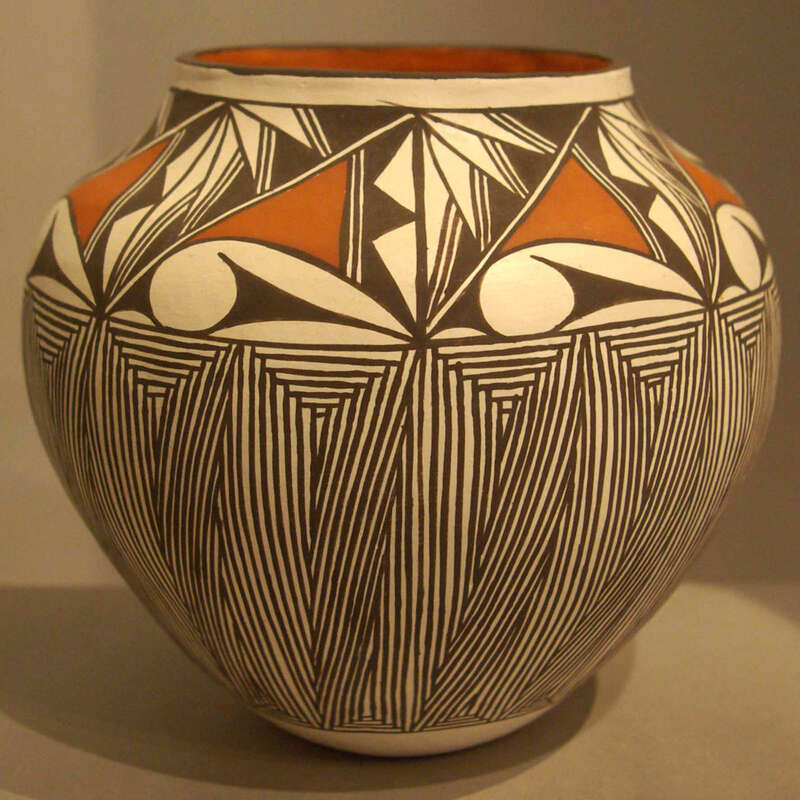 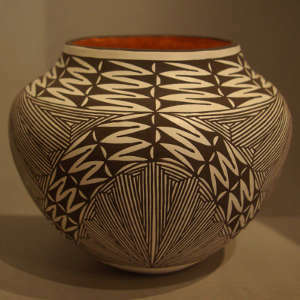 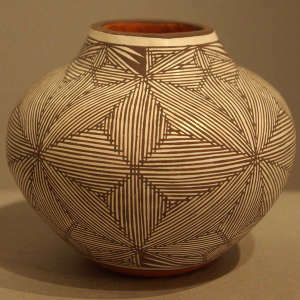 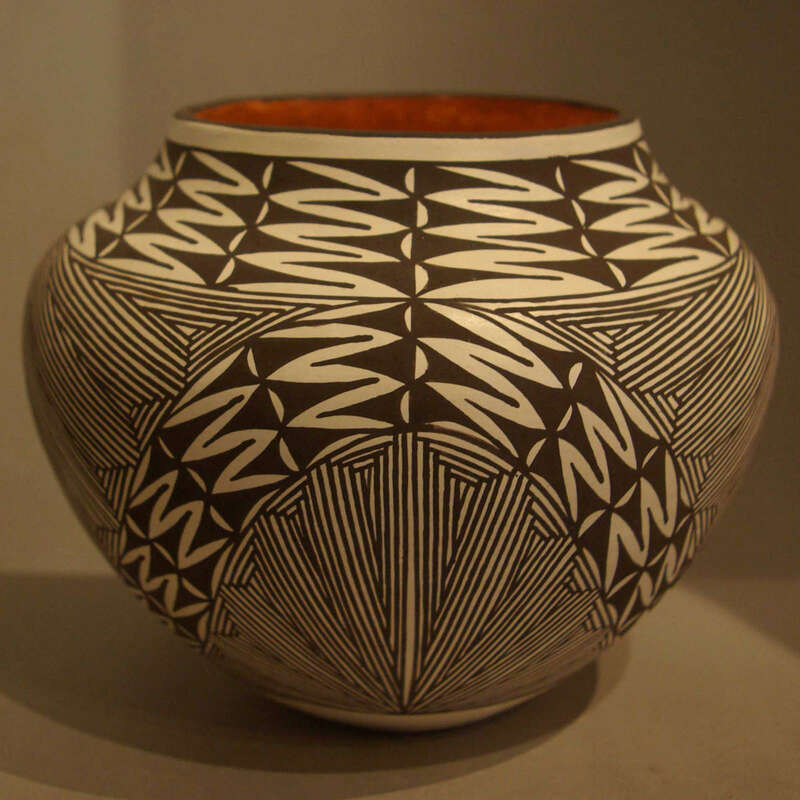 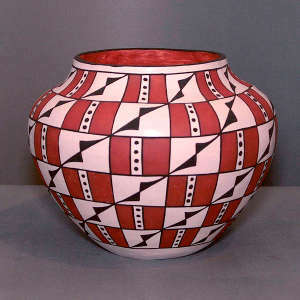 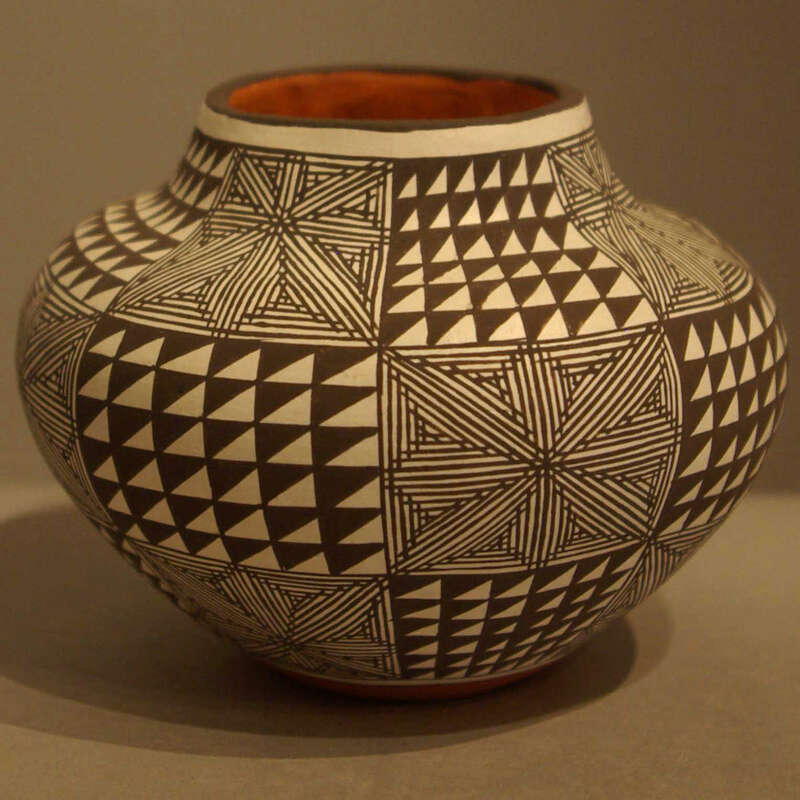 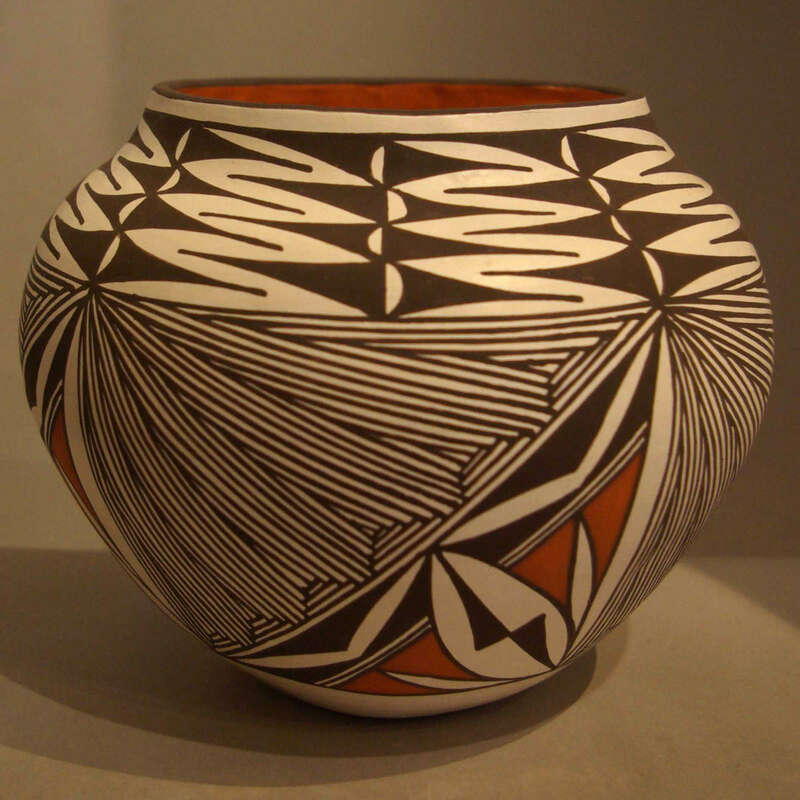 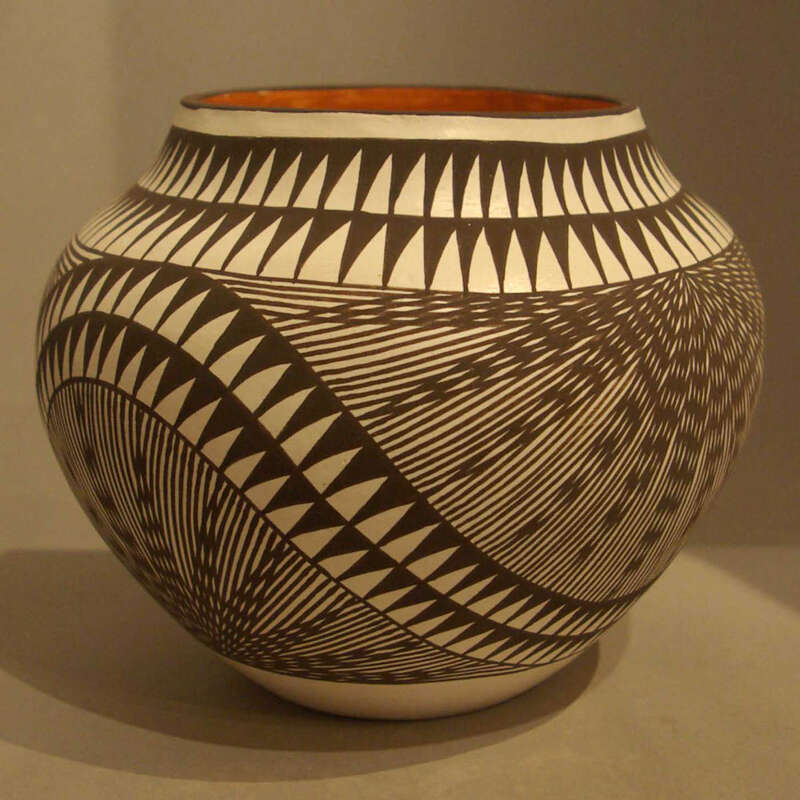 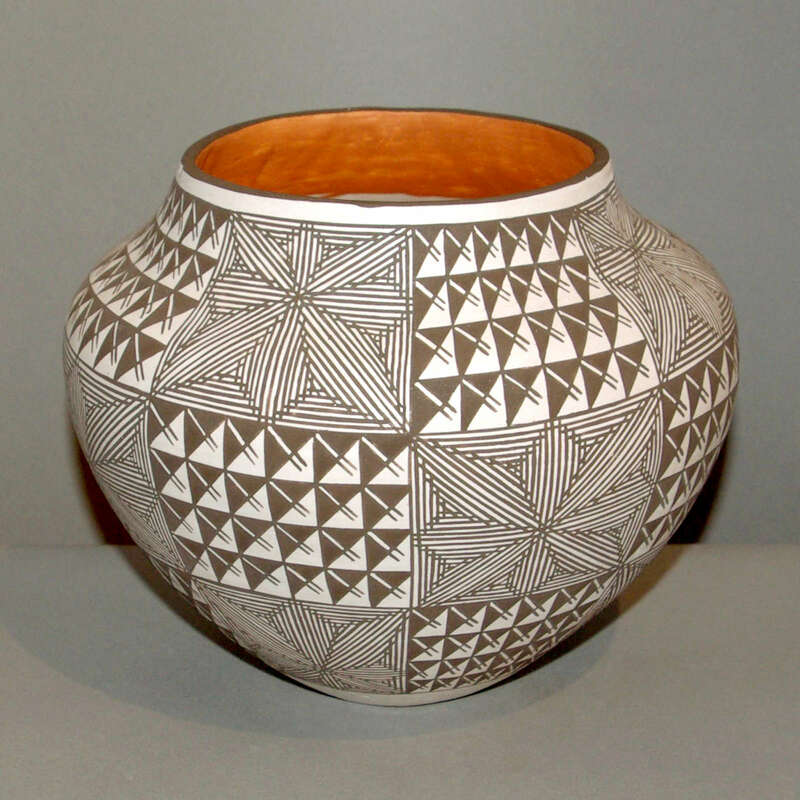 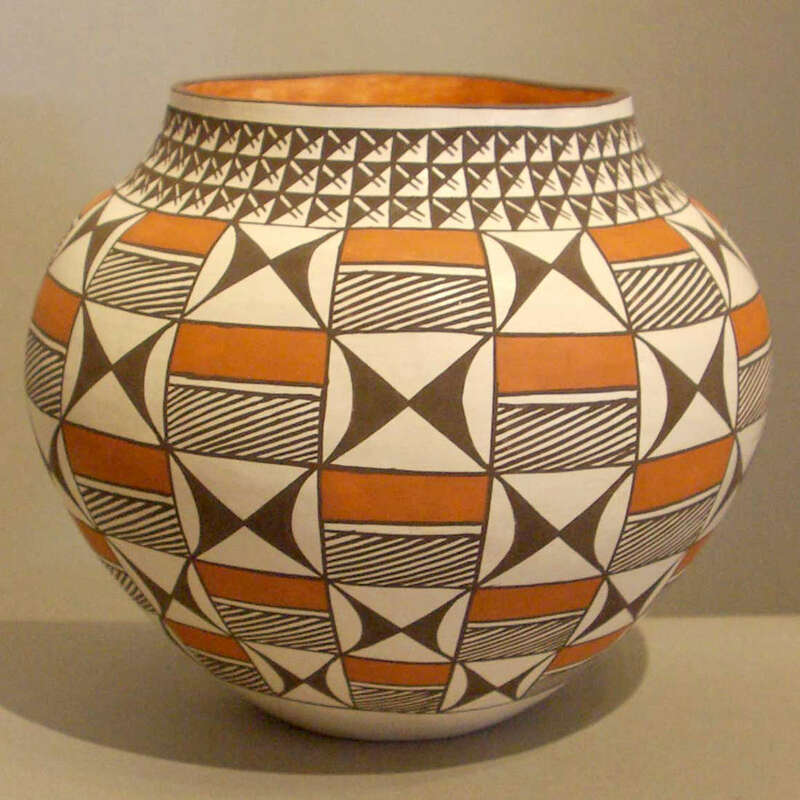 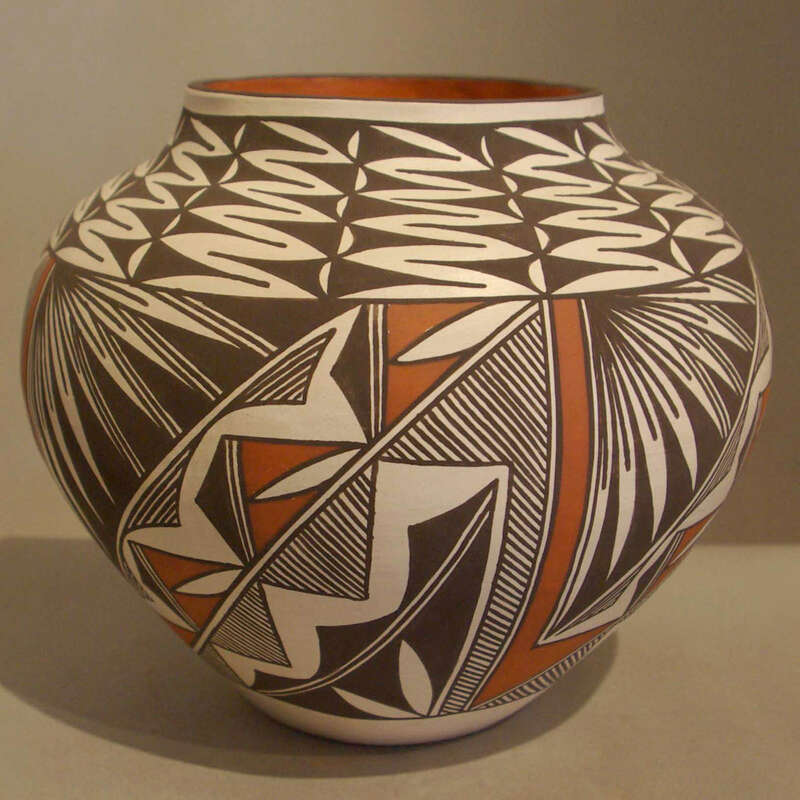 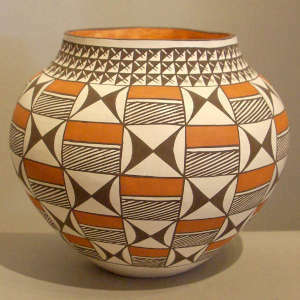 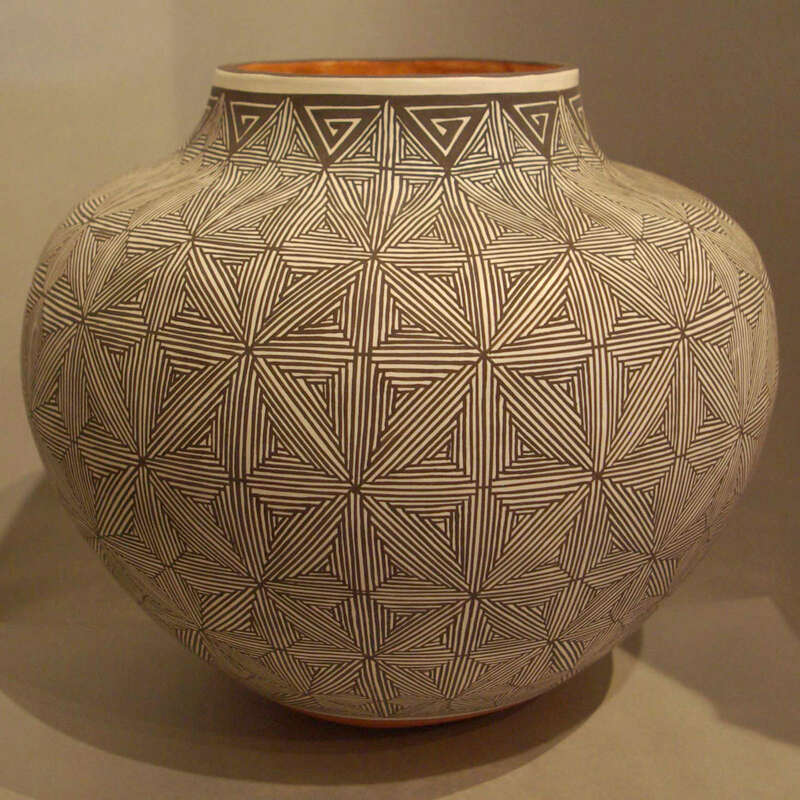 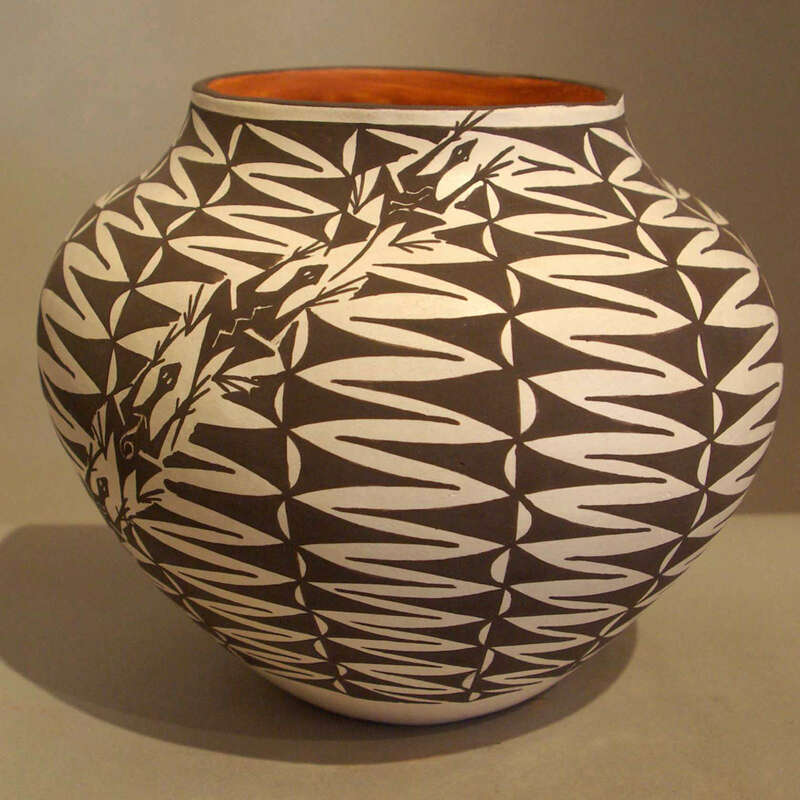 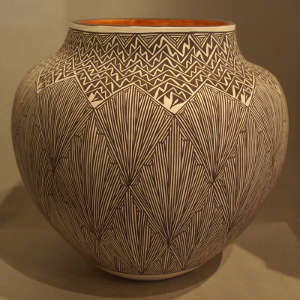 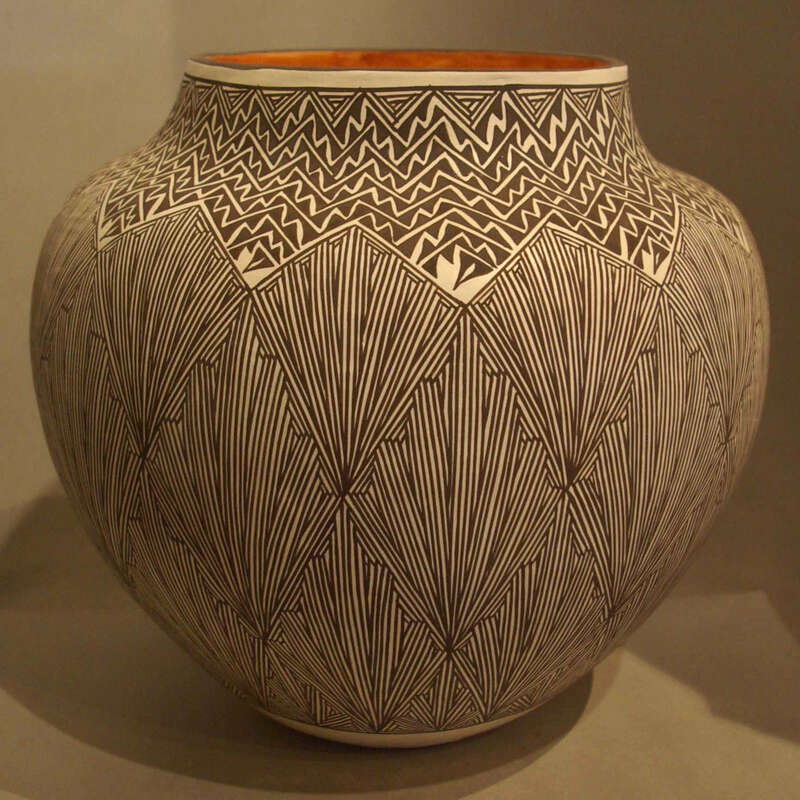 Marietta Juanico learned to make pottery from her mother, Frances Concho, and grandmother, Helen Patricio, both respected Acoma Pueblo potters. 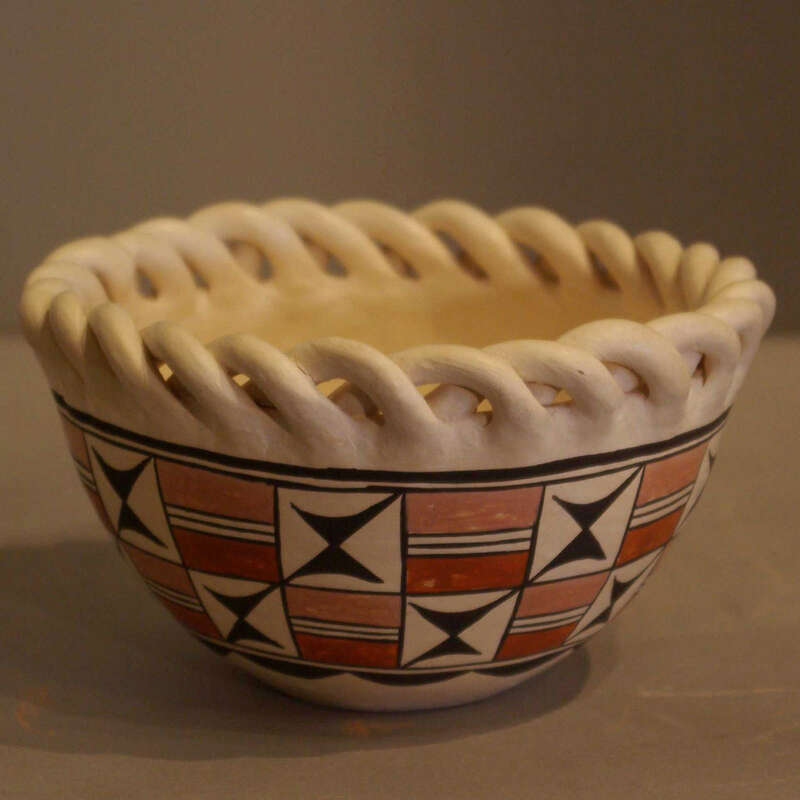 When she was six her grandmother started teaching her to make small pots. 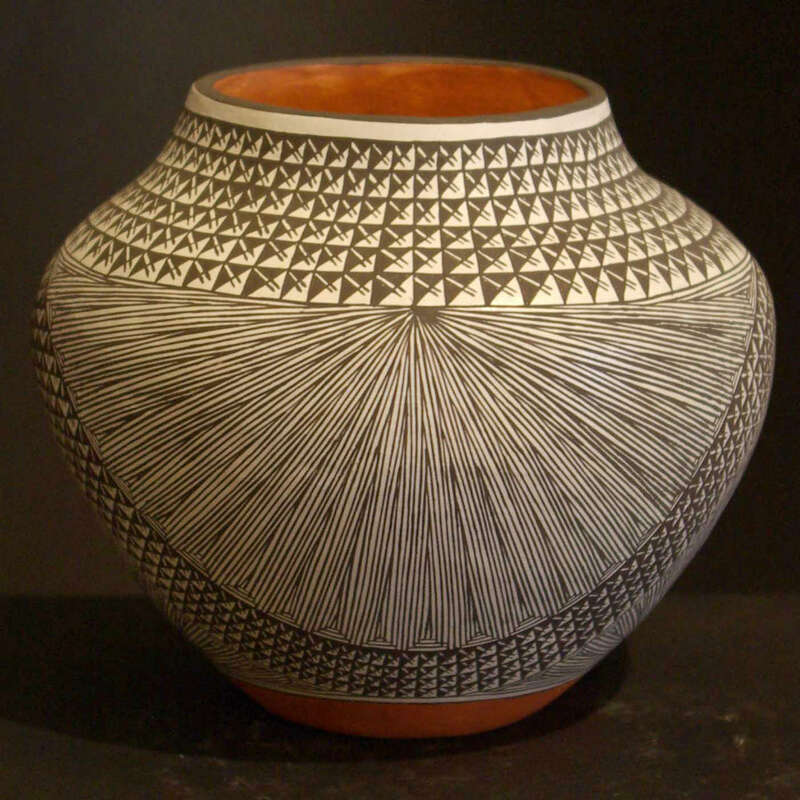 "By the time I was in high school, I was good enough to sell with my grandmother on the Mesa Top at Acoma," says Marietta. 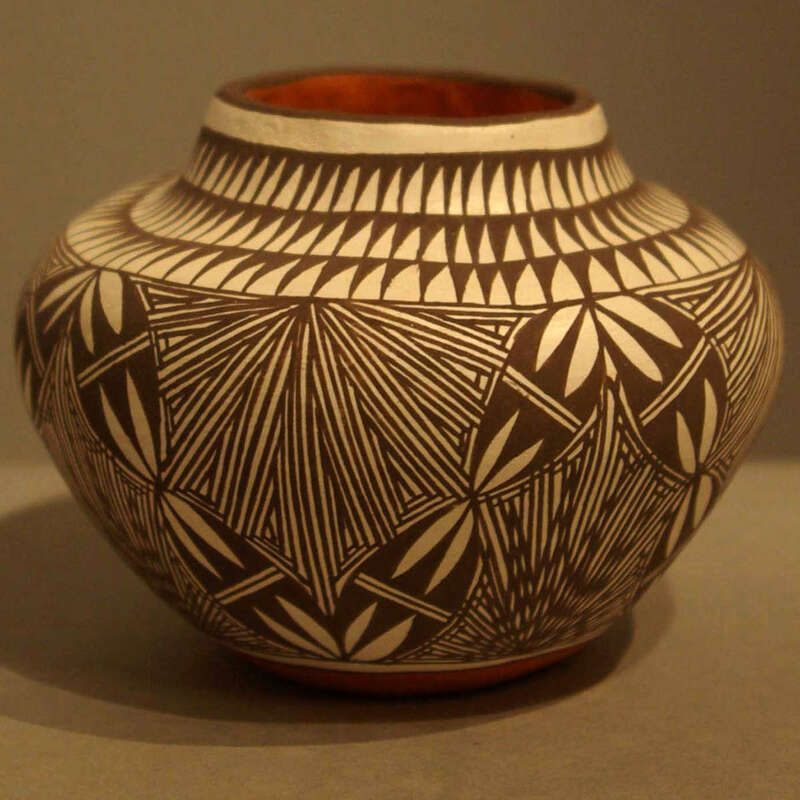 "I made small and medium sized pots until after I was married. 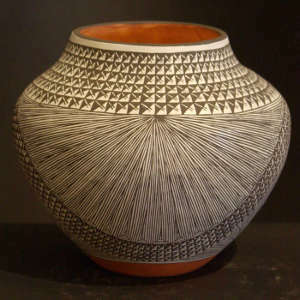 Then, my mother-in-law, Marie Juanico, encouraged me to build larger pots." 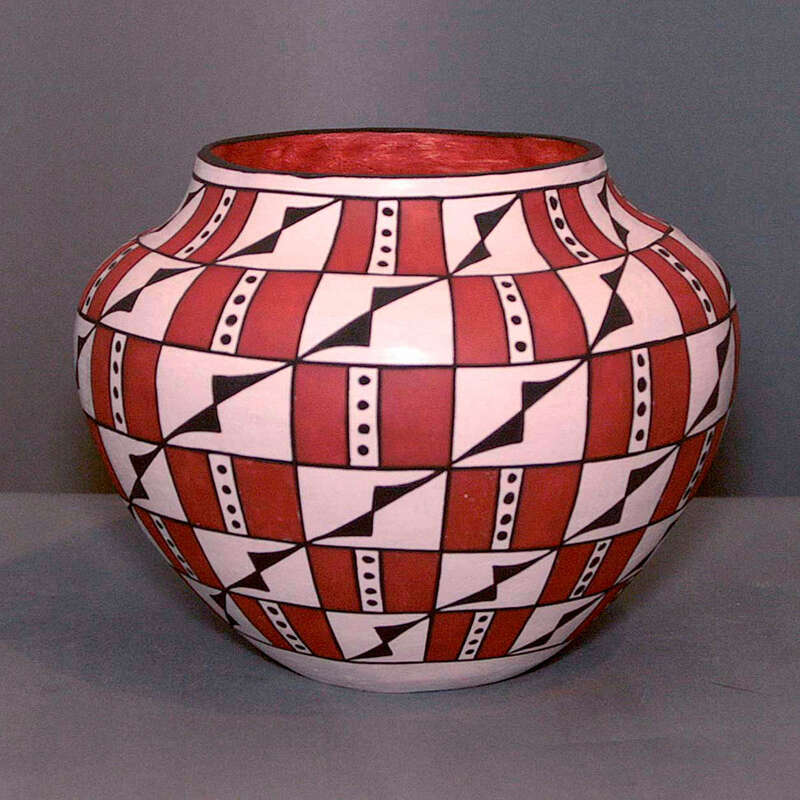 Over time, Marietta has made pots from 1 inch to 24 inches high. 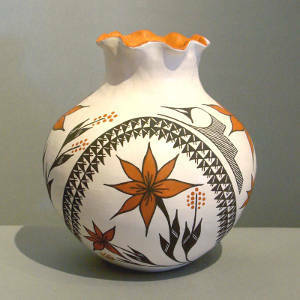 Marietta’s pottery is elegant and graceful, spanning the range of shapes from wide mouthed ollas to long neck vases. 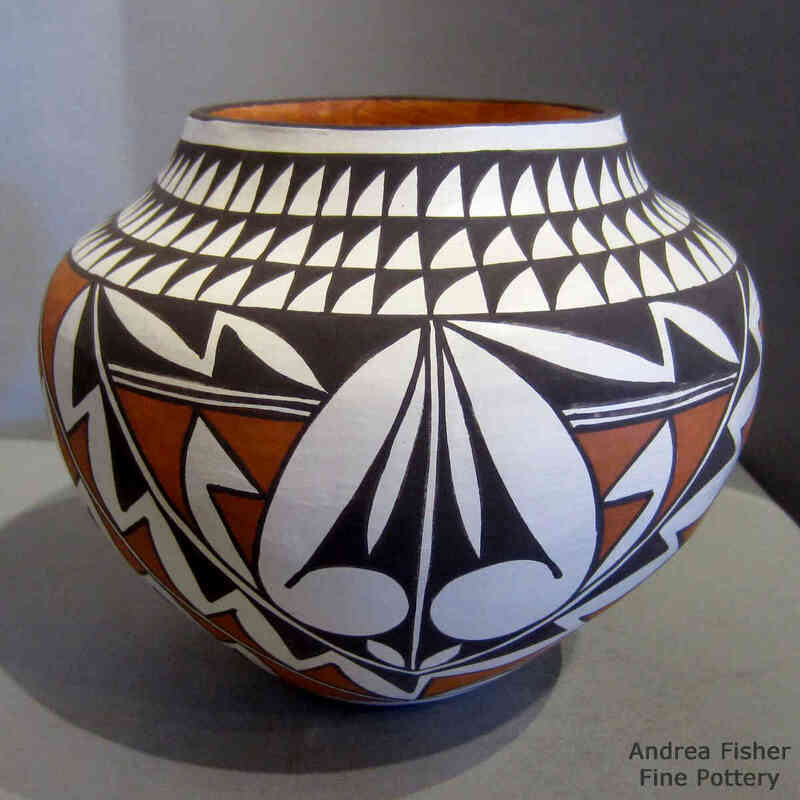 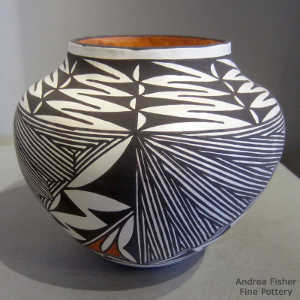 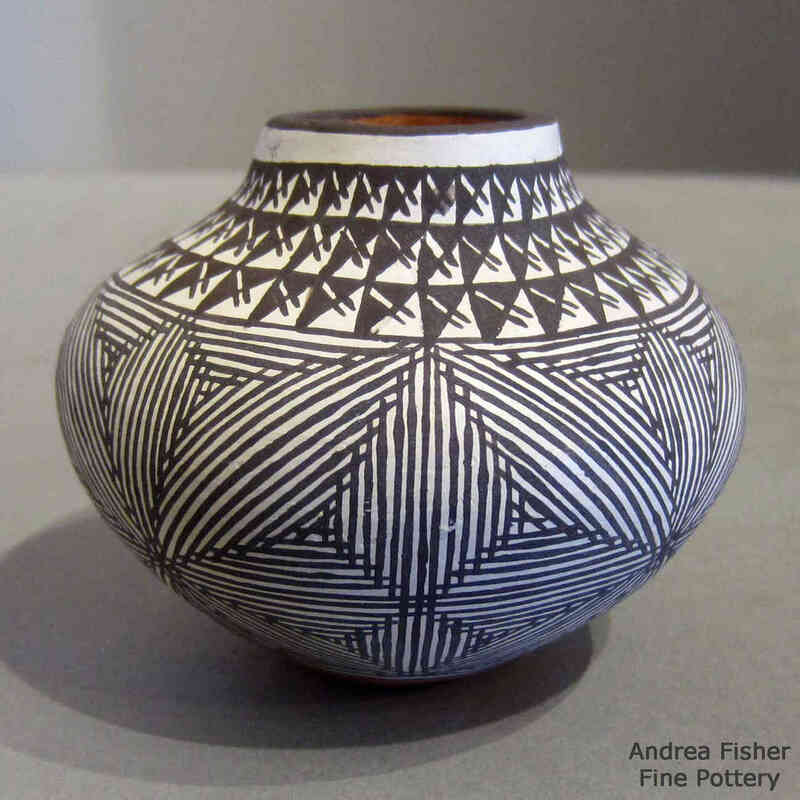 She often captures the shapes and forms of the old water jars and vases in her smaller works, then uses traditional designs found on larger pieces to decorate them. 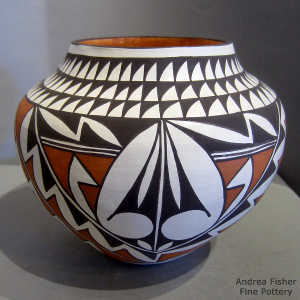 The walls of her pots are thin and smooth, the painting clean and precise. 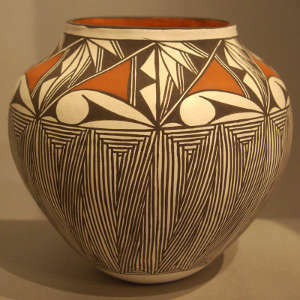 She uses mostly traditional, but some contemporary, designs, several of which were passed down to her from her grandmother - in particular the black on white fine-line Starburst Rain pattern and the orange squares and brown triangles that make up the Butterfly pattern. 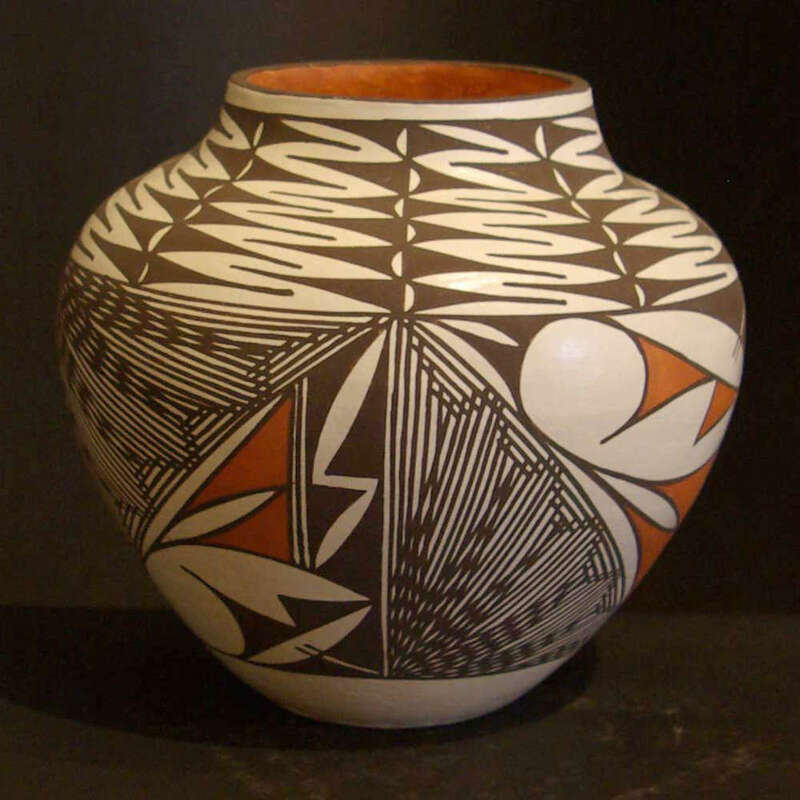 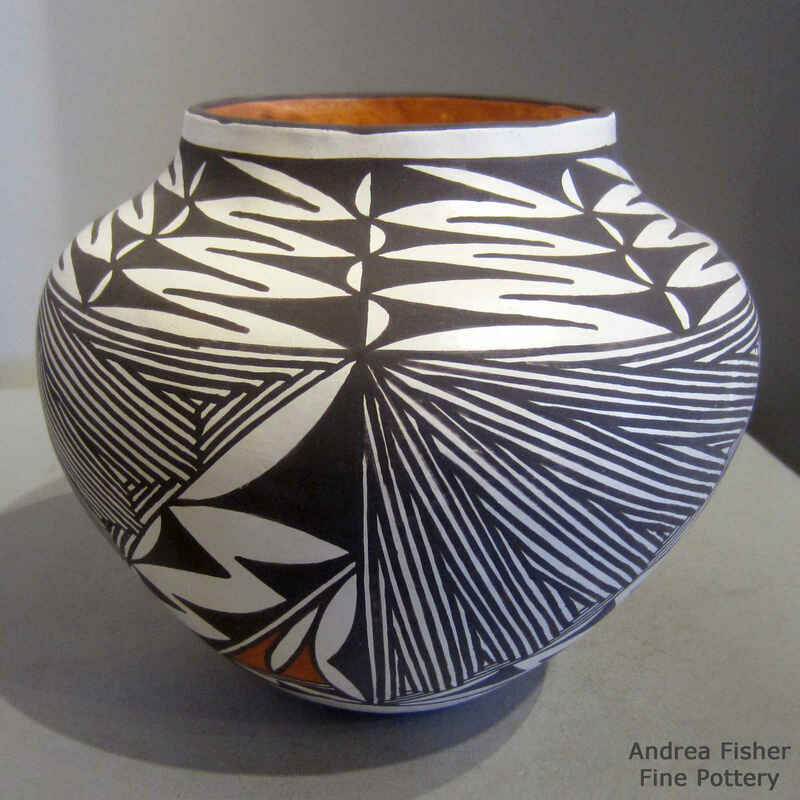 Like other pueblo potters she says "All of my pottery comes from the earth." 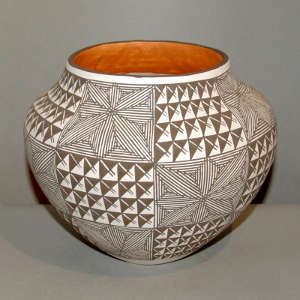 The clay and pottery shards (broken pottery, crushed and used for tempering new pots) are mined on Acoma Pueblo property. 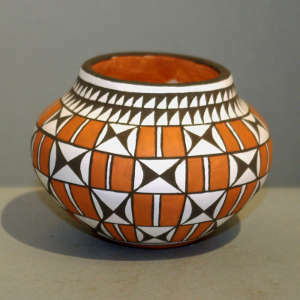 The yellow-orange paint comes from yellow sand that has been strained and ground fine. 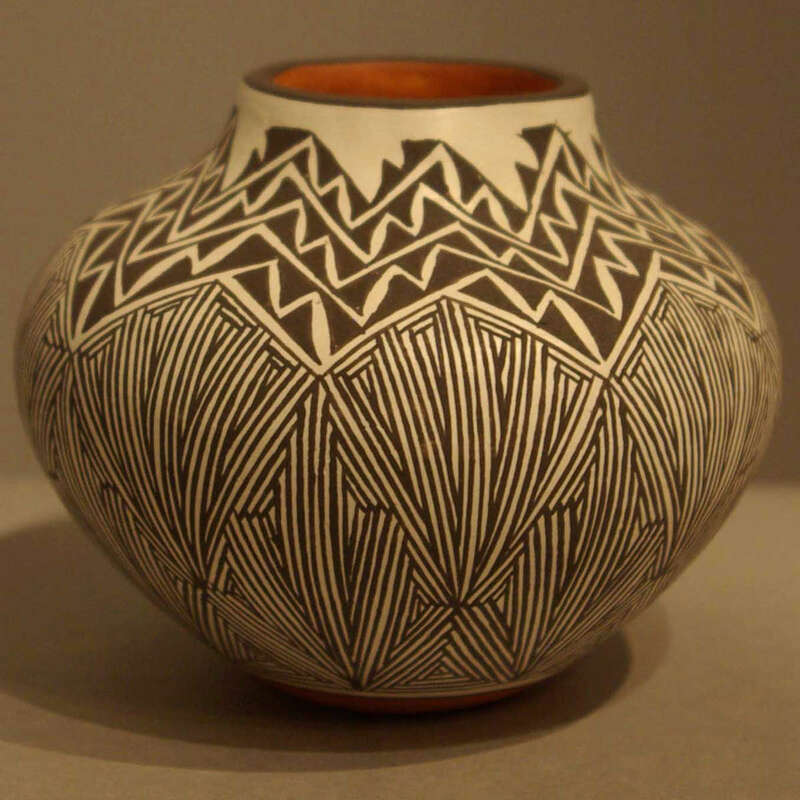 The brown-black paint is ground from a stone found in dry riverbeds on the pueblo. 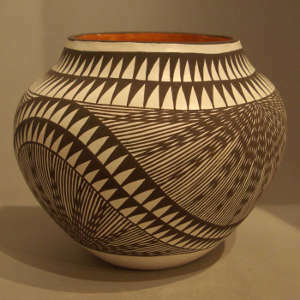 Her pots are hand-built with the traditional coil technique. 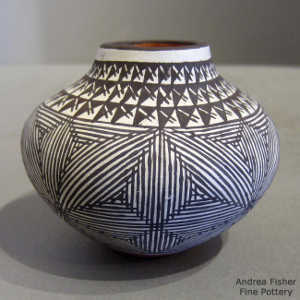 She uses a coconut shell and wooden paddle to shape them and a smooth river stone to polish them. 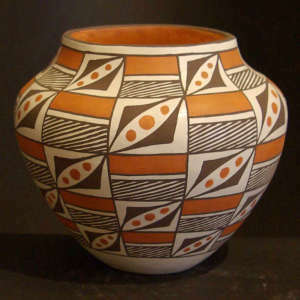 For different sizes and style of pots she has stones of different sizes, the largest one a gift handed down from her mother. 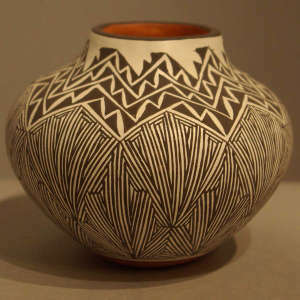 Marietta also uses the old-style yucca brushes to paint her designs because they work much better (for her purposes) than any commercial ones she has tried.